I attend this festival every year. 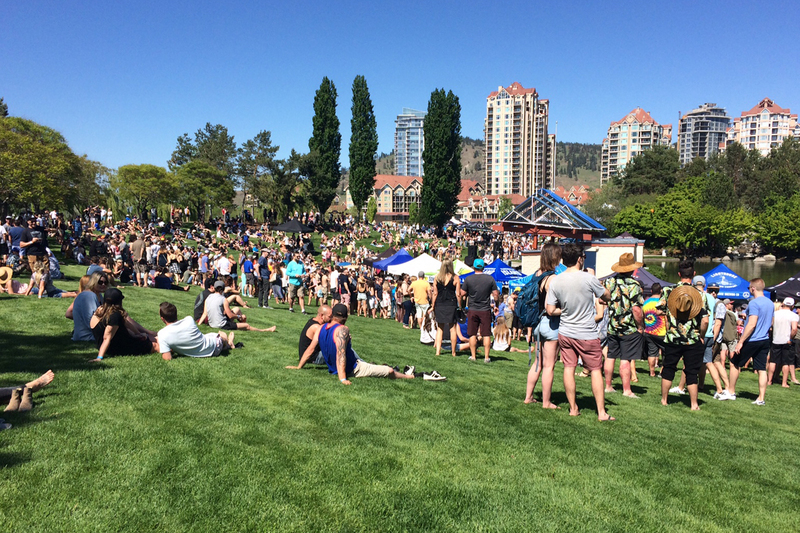 Kelowna folk are a beer-educated bunch. The weather co-operated for this annual showcase, which spills out on the waterfront. It’s an upbeat location for an event. The gates opened and the event hit the day flying and went hard all afternoon till close. The majority of the crowd was young and energetic. Non-stop music rocked the stage, and food trucks were on site for a variety of festival food. Cider was also giving a good showing at this event. In this region of the province, cider is growing in leaps and bounds because of the great fruit and the movement towards all things craft. Lots of fun happenings associated with the festival were going on around town. 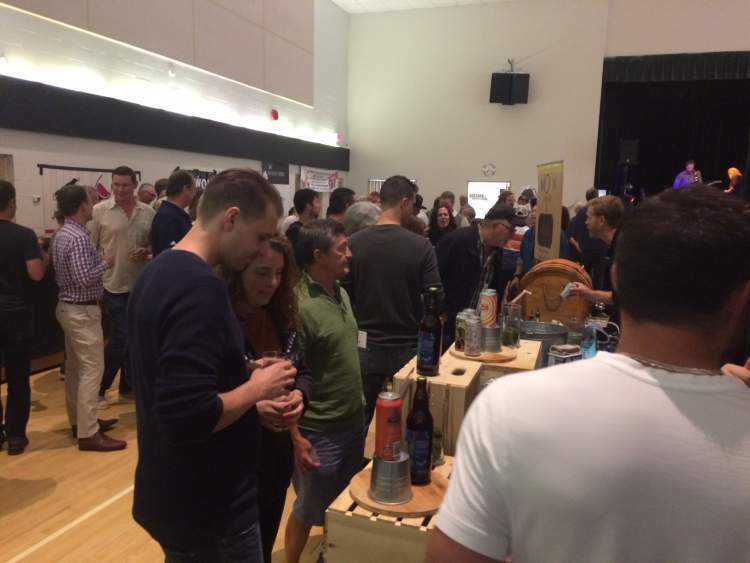 A very happy crowd enjoyed a fun and tasteful day of good beers and ciders. Thanks to all who commented on our publication. 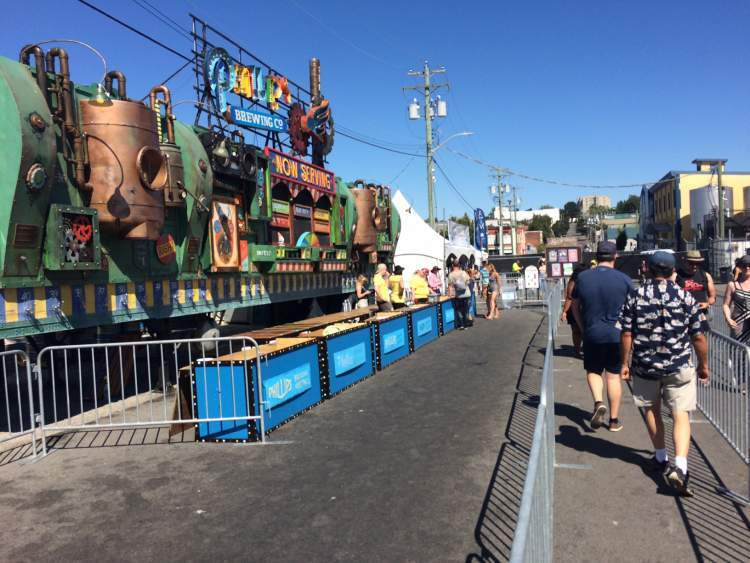 This is a Victoria hometown event and everybody seemingly returns year after year. It’s one of those “go two steps and you run into someone you know” events. Not all the beers were hoppy which made the event even more interesting. New breweries were there showcasing their products. There was a summer buzz of enthusiasm in the air. People now know, without a shadow of a doubt, who What’s Brewing are. We have fun engaging folks whilst they say their bit about this or that special brew. It’s a fun day of socializing. Phillips Team provided an after party for brewers and guests at their new tasting room facility. Well done Phillips team and their helpful staff. This was one of those open the doors and serve non-stop for the brewers and cideries, and liquor purveyors. It was supposed to be an industry portion for the first hour, but somehow everyone seemed to flood in right from the beginning. All the reps and the presenters were ready and keen. I paid particular attention to the more regional up-island breweries, and distillers. The crowd was civilized and keen for knowledge. Free smokies and burgers were provided for everyone from the onset. People had a good evening out, learning, sampling enjoying. I also ran into some of the brewers at the Shady Rest, a true waterfront pub on the beach in Qualicum. Good spirit, Qualicum Beach beer folks. I had never covered this hometown Victoria event. This year, I went on the Sunday and caught the first 3 acts. People had room to spread out and the weather was summer spectacular. The grounds were huge, creating a fun city within itself. Ticket sales for beer were organized, Phillips beer and Merridale cider easy to get (no big line ups), and served by pleasant volunteers. There was a food truck street created on the site, and people were taking advantage of the many varieties on offer. It was a good feeling, with people in a jovial mood, happy and engaged in dancing, socializing and generally grooving on the whole scene. The variety of music was extremely diverse. I could see just how big an undertaking this is. Spokesman Dan Reid said they get 6,000 to 8,000 people a day; and to accomplish this with everything involved, takes a well-organized team. If you live in Victoria and have not visited this event, put it on the calendar for next year. It was good to see everyone, and we thank you for your support of our publication. We do it for the fun of it and this was a fun time. I came by this new startup, which was in its 5th week at the time. 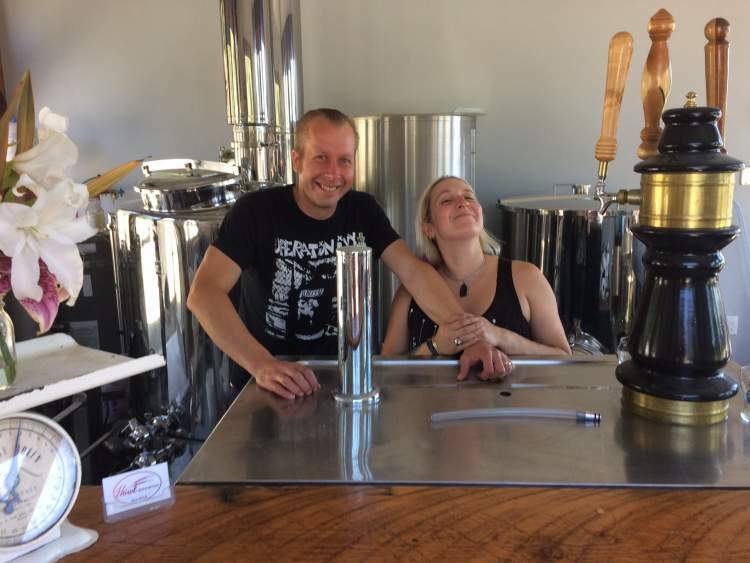 I spoke with owners Dan and Alanya; they explained that their malt is Gambrinus from Armstrong, the hops from Chilliwack, and the fruits are local. I had 3 samplers and a quick visit. The crowds just kept coming, keeping them going hard at it! As mentioned cider has really taken off for the last couple of years and as an honourable mention, the taste sensation of the summer for this reporter was Wards Cherry Craft cider. This small country festival sells out 500 people each season. Ferries from the Mainland and Island make it easy for people to come and go same day. 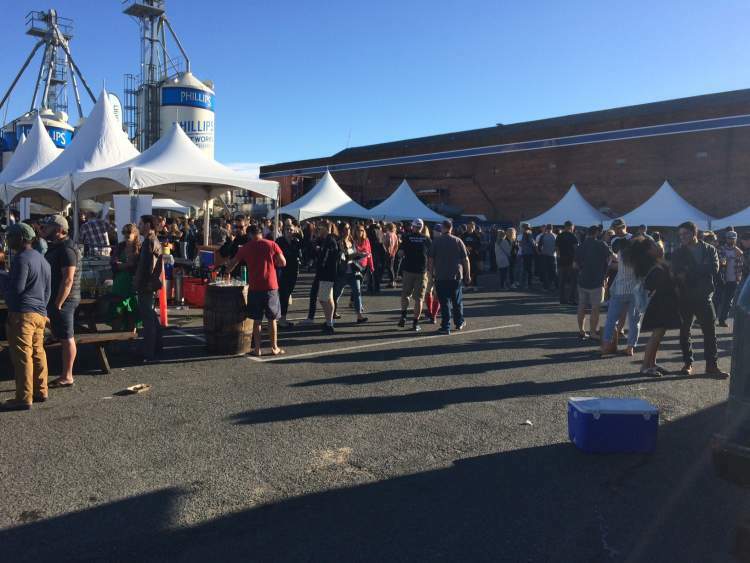 People enjoyed the local brewers, cideries and wineries dispensing a wide array of craft beverages. It is civilized and relaxing and well done by all the volunteers. 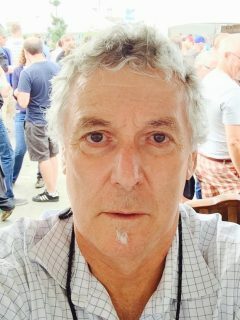 Scottie is a craft beer industry member and longtime supporter of of BC’s Craft Beer Movement. He has written for What's Brewing for over a quarter century.